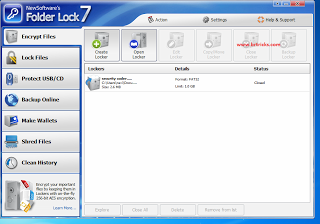 Here is the solution on how to Reset your Master Password of Folder Lock 7.2.X fast and easily but first i will like to teach you a new method on how to recover folderlock 7.2.x password without hassles. Many people have been reporting on this topic that serial key for folder lock 7 works perfectly but whenever they lost their password and want to recover it the methods will prove abortive. All you have to do is to follow the direction i will give you now strictly to have it recovered immediately. There will be a string value as “ _pack ” , Double click on it. In this tutorial, the resulted (reverse ordered) word by step3 is " gsffibdlufdi " & after decrypting like step 4, it will become " freehacktech "
For example Folder lock v7.0 or something the same as the locked version of your folder lock. Then just Install it. Then let it run automatically after the installation. You will be prompt to login using a new folder lock user id and folder lock registration key. Enter your folder locker Serial Key to unlock it right away. After you have entered the information above, follow the programs direction until registration is finish. Start folder lock and when the program ask for the password, you may use the folder Registration Key stated above. Now that you have successfully entered the program, you can reconfigure it based on your preferences. If you want to uninstall the program which I did, click "options" and select uninstall. The system will require you to reboot your computer after it was uninstalled to remove unwanted folder lock backup your files. I hope that your problem will by any of these means be solved.